Director Wes Anderson has ever really wow’ed me with any of his previous works, often they are too wild and unprecedented, but with The Grand Budapest Hotel he has excelled. Our story begins from the perspective of a writer who, in visiting a rundown Hotel, meets the owner who tells a tale of the Hotel’s exciting, quirky and unorthodox history. He was once a Lobby Boy who becomes the Hotel concierge’s confidant when he hides a valuable painting left to him by a deceased guest. However, the guest’s “extended family” are wanting the painting for themselves, and they will do anything to get it. 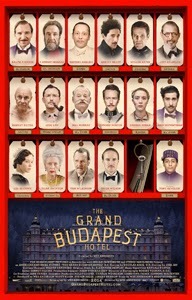 It is easy to say that Ralph Fiennes owns this movie as hotel concierge Gustave. He is ridiculous and hammy, but enthusiastic and buzzing with self-confidence. The film is loaded with actors who frequently blend into their roles: Edward Norton; Tilda Swinton; Bill Murray; Harvey Keitel, even Jeff Goldlum, Jeff Goldblum does well in this film! They all have such small but crucial roles that they blend in, and their familiarity only adds to the film’s perplexing atmosphere. But it is far from just the acting talent that makes the film shine. Wes Anderson has shot the film in such a way that intensifies the quirky weirdness that this Hotel exudes; ninety percent of the shots in the film are very symmetrical! Shots are long and still as the characters rant and quip to each other. There are dozens of tracking and panning shots throughout bright, gaudy and antique settings, making the narrator’s accounting of events seem dreamlike. The way some of the comedy is paced and executed reminded me of some old Monty Python-esque humour. Chase scenes are very stylised, cartoonish, or similar to pantomime. Everything is given a very jovial, honest vibe whether it be love, imprisonment or murder! It may not say very much, but The Grand Budapest Hotel was a fine and riotous experience and I would surely check in again.